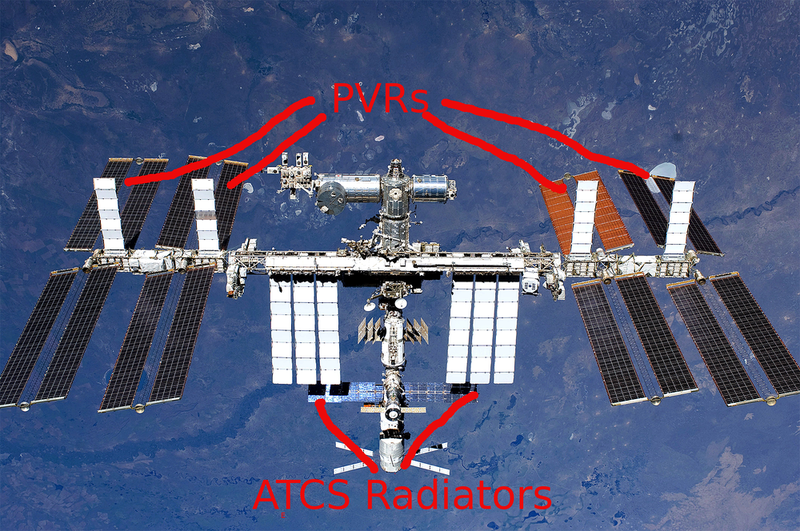 Heat balance of the ISS: breakdown? Is there available breakdown of the heat balance of the International Space Station? How much heat is produced? How much heat is radiated away? The mentioned categories are just examples what I understand under the breakdown, a breakdown into different categories will also be very interesting. The External Active Thermal Control System has two independent loops, each of which can reject up to 35 kW, for a total of 70 kW. The EATCS provides heat rejection capabilities for all U.S. pressurized modules and the main power distribution electronics on S0, S1 and P1. Additionally there are 4 PhotoVoltaic Radiators (PVRs) which cool the solar array power generation systems. Each PVR can reject up to 14 kW. Total heat loads must remain less than the capabilities of these loops in order to control the internal temperature. Not the answer you're looking for? Browse other questions tagged iss heat or ask your own question. How much heat did the Sabatier hardware add to the ISS heat profile? How does Bigelow plan to handle heat rejection on the BA-330? Why do some spacecraft have heat radiators? Why not repurpose the energy? Has the monthly average skin temp of the ISS increased during its years in orbit?